I mentioned before that I was using an old-school tape recorder to capture ideas—while walking, while in the shower, while sitting at my desk, wherever. Having happily used it for nine months, but experiencing some glitches, I decided that I deserved an upgrade to a digital one (also recommended by Doug in the comments). I got the $80 Sony one, which has great reviews on Amazon. There's a $60 Sony one as well, but it doesn't have a USB connection, which actually came in handy for me once so far. The digital has a lot of advantages over the analog, including: a battery indicator, no cassette door that could be partly open, ability to replay/delete individual notes, 5 folders, consistent playback quality. 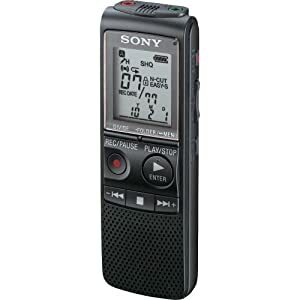 For me, a dedicated voice recorder is the fastest way for me to jot down an idea—faster than writing it down in my wallet pad; more space than on my cell phone recorder; no need to enter a password as I would with my PDA. posted by Jonathan at 11/27/2010 12:13:00 p.m.
Nice, I wish I had a USB one now as I use Dragon Naturally Speaking a bit on the PC (Windows) and it can use dictated stuff. Dragon wasn't a great purchase but I give my joints a reset a few times a day by dictating. By Doug Ransom, at 11/28/2010 8:25 a.m.
@Doug - That's interesting that you use Dragon Naturally Speaking. Sounds like a good way to give your fingers a break from typing. By Jonathan, at 7/21/2011 8:05 p.m.